I am often asked what is my favorite cookbook. The truth is I don’t often use cookbooks but am seduced to try recipes featured in the splashy pages of magazines or food blogs. An exception to this is a tattered, much loved cookbook that has travelled with me through moves across countries and homes. It is rather plain and has nary a photograph in it. 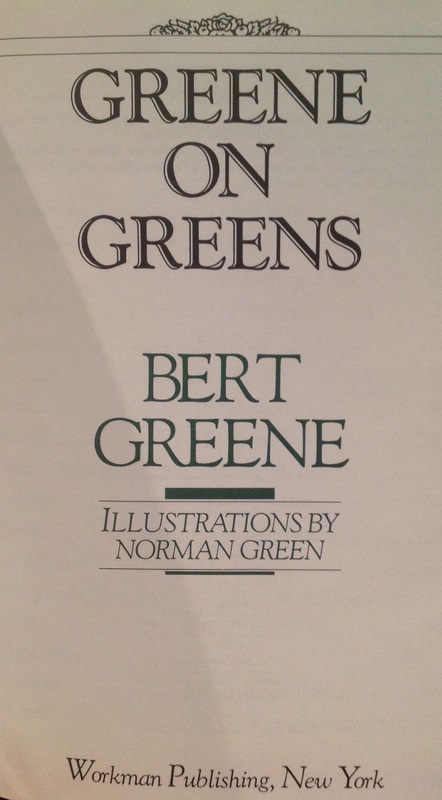 It is the cookbook “Greene on Greens” by Bert Greene, a food columnist and author who died in 1988. Mr. Greene is credited with developing the concept of the high end take out in the US when he operated a market from 1966-76 in tony Amagansett on Long Island, NY. He would grow many of the vegetables he featured in the shop and was ahead of his time pioneering the farm to table concept. In Greene’s own words, “The cookbook is a love letter to the 30 vegetables, green or otherwise, that I prize most in all the world.” What I love is that the book is organized alphabetically by vegetable. So when in season, you can flip open to say, eggplant and find a dozen or so recipes for the vegetable with terrific anectodal and historical information on the veggie being featured. 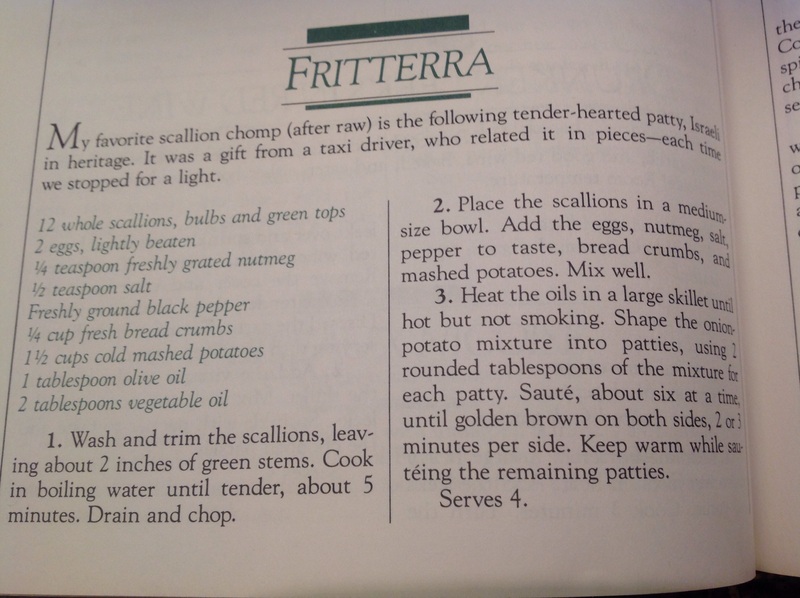 With not one splashy photograph, this is the kind of cookbook that might be overlooked. Greene’s writing is witty, passionate and lyrical. His descriptions are such that the reader ‘s imagination conjures the image. 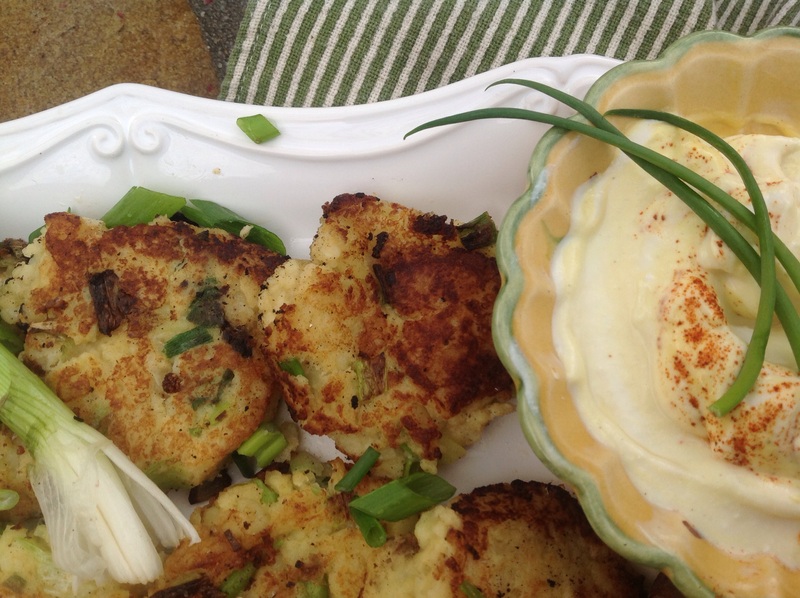 This recipe for scallion~potato fritters could not be easier. 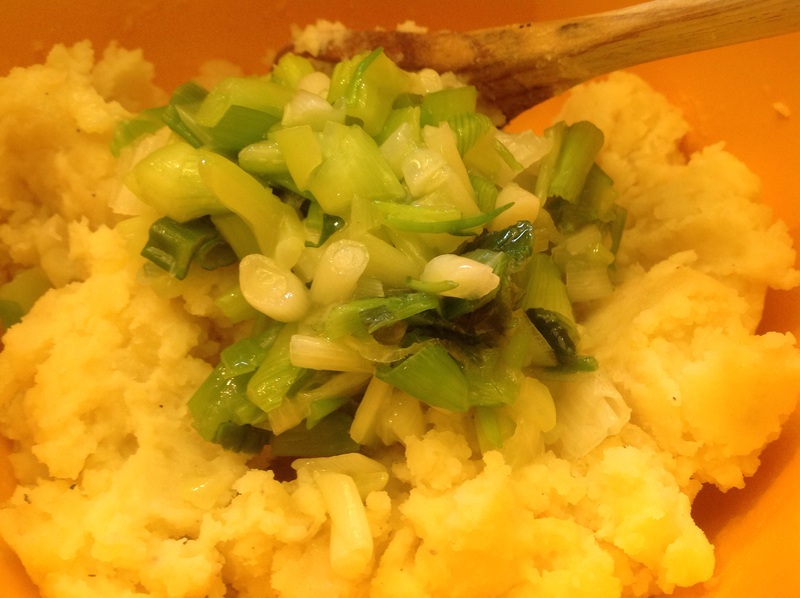 It is a great way to use the new crop of spring onions. 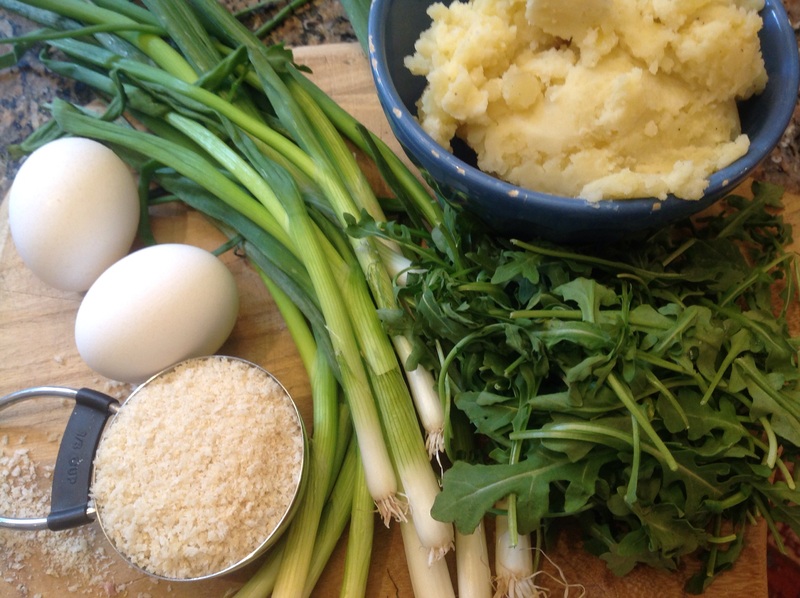 It would be fantastic with the cult favorite, ramps. 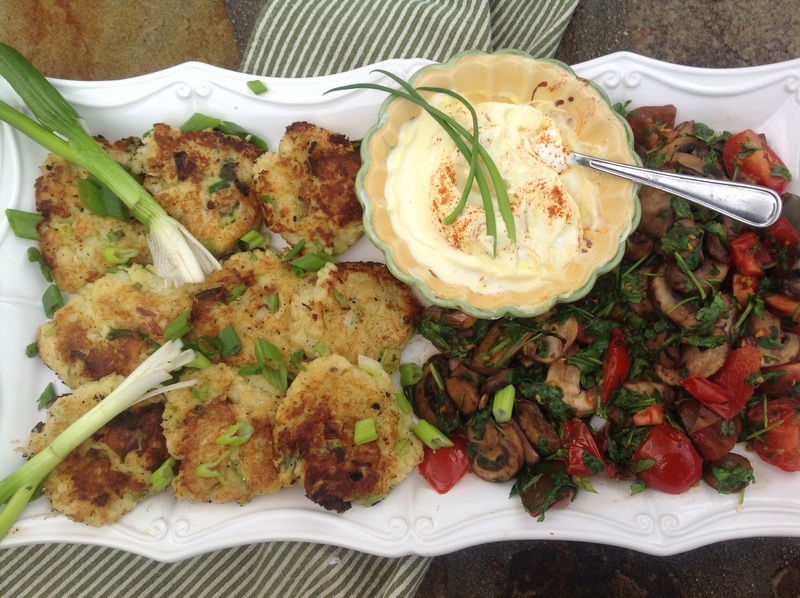 I served ours with a warm salad of portobellos, cherry tomatoes and arugula and made a spicy mustard dip to accompany the cakes. Your legacy is assured, Mr. Greene. 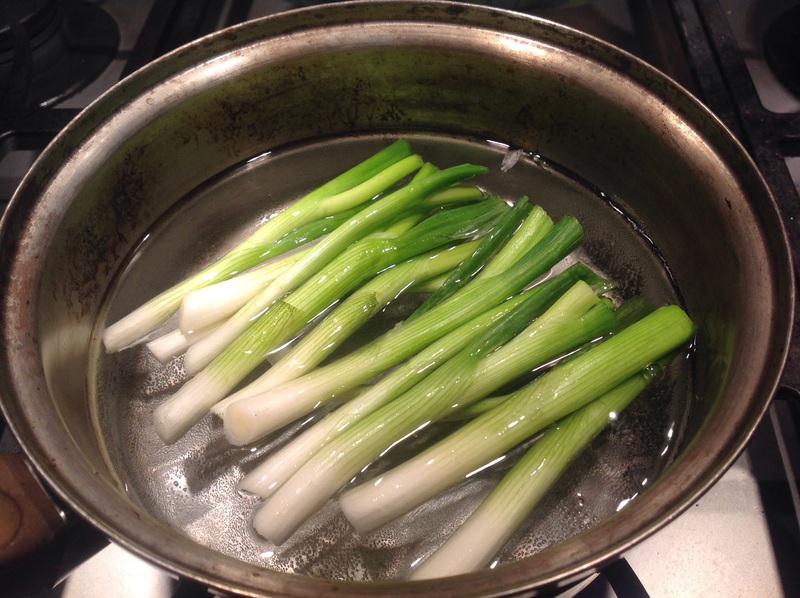 Wash and trim the scallions , leaving 2 inches of green stems. Blanch them in boiling water for about 5 minutes. If you don’t mind the bite of a scallion, you can skip this step. Drain and chop. In a mixing bowl place the mashed potatoes. 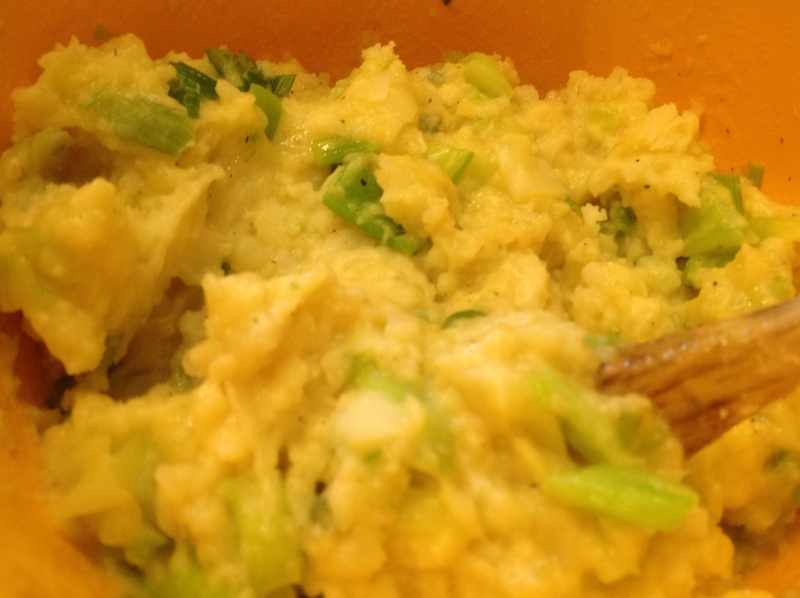 Add the scallions, egg, bread crumbs and salt and pepper and mix well. Shape into patties about 2 tablespoon in size. Heat the oils in a skillet and fry the patties until golden, turning once. Serve with the mustard dip. 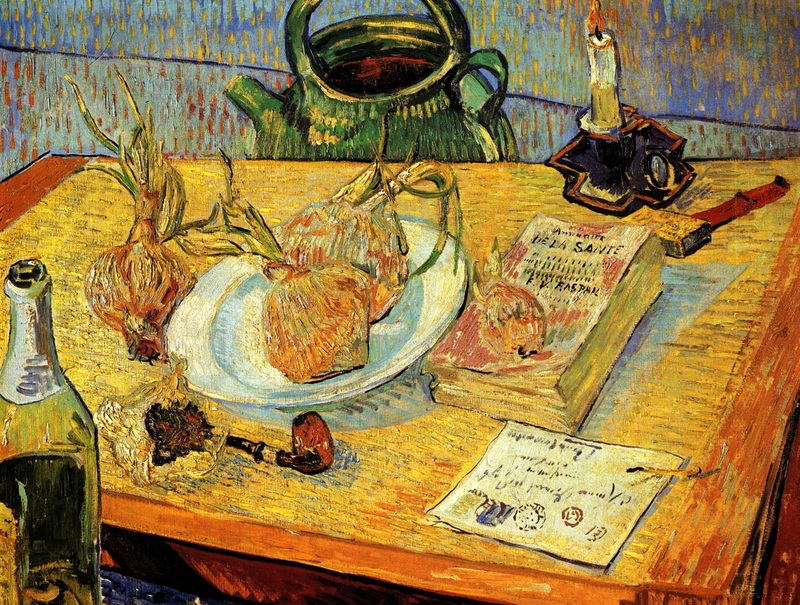 Pipe, Onions and Sealing Wax, Vincent Van Gogh, 1888, Riksmuseum Kröller-Müller, Otterio, Netherlands, one of my favorite museums in the world with an impressive collection of Van Goghs! 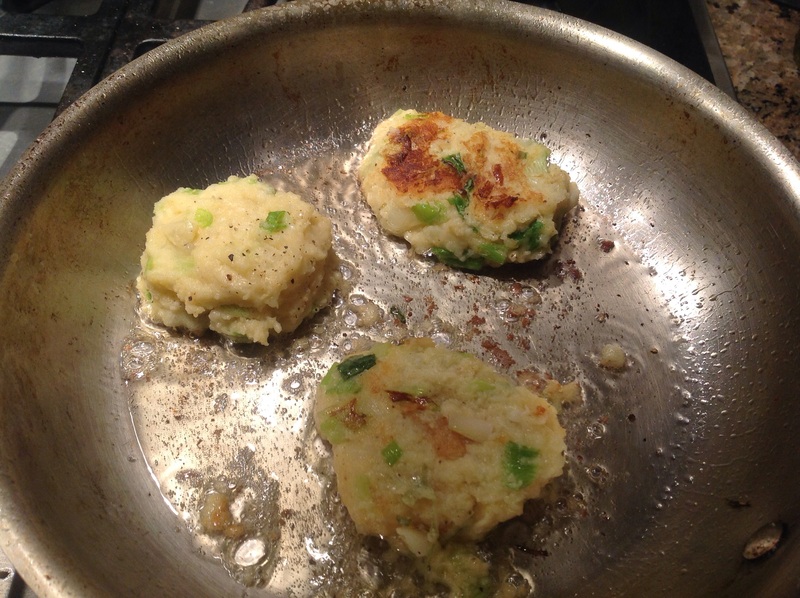 This entry was posted in Recipes and tagged Potato green onion fritters, potato scallion pancakes by Johanne Lamarche. Bookmark the permalink. Looks and sounds lovely. And your sauce on the side looks delicious too! Thank you! Glad you liked this simple weekday meal. As the Dutch say:”LEKKER”! (= tasty) The Kroller Muller is one of my favorite Musea as well. 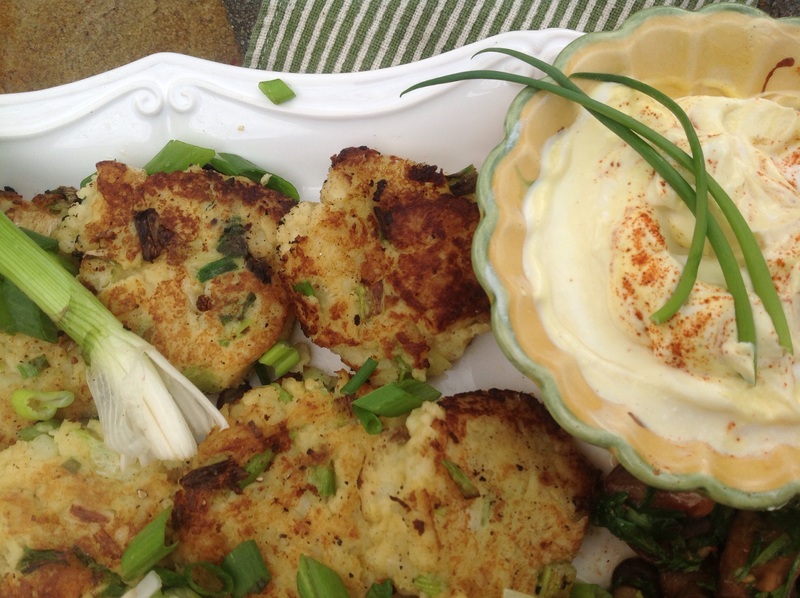 Good way to transform left over mashed potatoes for a quick weekday meal. I KNOW you will be remembered!!!! Do you ever reveal your real name?? ?